Upper register: Detail of the centaur Chiron from a painting depicting Peleus' capture of the Nereid Thetis. 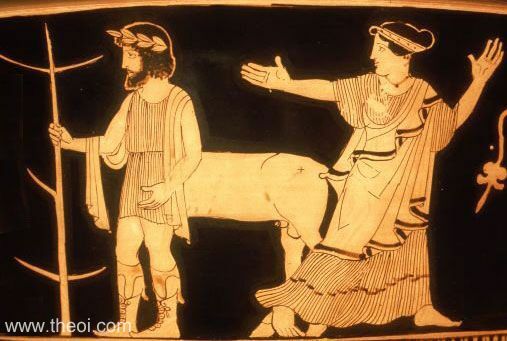 The centaur is depicted with the full body of man including human legs and feet with an equine torse and rear-legs attached to his rump. He is clothed in a chiton and holds a branch-staff in his hand. To his right, one of the Nereid Nymphs flees the scene of her sister Thetis' capture. Lower register: Boreas pursuing Oreithyia (see other image).